For those of you who know me, I am as surprised by the topic of this post as you are. For the rest of you I'll explain: I really, really dislike the presence of sports at parties. I just don't see the point of everyone staring at the TV and barely speaking to each other at a social gathering. Especially when inevitably all the women end up crowded together uncomfortably in a brightly lit kitchen. This year I didn't know who was playing until it was mentioned on Chelsea Handler's round table Monday night, and I still don't know where a Bronco is from. So far the most exciting part to me is this mention of a Full House reunion during the commercials. All that said, I've realized that between the baby shower earlier this month and the Valentine's luncheon I'm currently planning, there has been a lot of girliness around our apartment lately. While my husband hasn't complained about it, I feel like it's time for an event with a more masculine focus. So I've offered to help him host a Superbowl party this year. And don't worry, no cutsey football shaped cupcakes etc. - I've learned that men appreciate simplicity far more than fussy details. But while there's no need to spend hours crafting a cake in the shape of a football field, that doesn't mean you shouldn't put some effort in. Follow these 3 simple rules for a Superbowl party that won't turn your home into a frat house. 1. Use real glasses. Period. After spending two years alongside my husband at business school, I made a simple request for our new home: no solo cups. 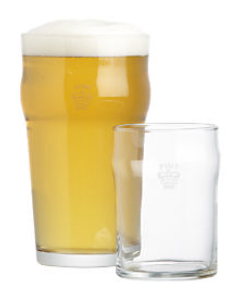 I've mentioned before that we bought a few sets of inexpensive stemless wine glasses to use when we entertain on our terrace, and I think we need to add a few sets of these half pint tumblers to our cabinet. Unless the packaging is exceptionally designed, I don't like serving food from the container it comes in. A bunch of crumpled chip bags strewn across the living room? No thank you. I think this wooden chip and dip is beautiful, yet masculine enough for a guys' party. If you're planing to order in, PLAN to order in. Meaning - don't wait until one of the busiest days of the year for food deliveries and end up making your hungry guests wait hours only to feed them Domino's for lack of better available options. These days there is a gourmet answer to any comfort food you can think of. So whatever you'd like to serve, schedule a delivery in advance. And by advance I don't mean the day before - many restaurants stop taking orders a week prior to the event. Here in Dumbo we have a great sub shop called No. 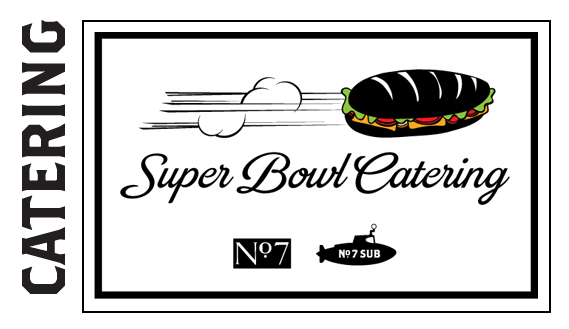 7 Sub - check out their Superbowl menu for inspiration.